The market for anti-snoring devices is substantial and sometimes difficult to navigate. Moreover, many devices claim to have similar, if not the same features, making it hard for you to find a product that suits your needs. Therefore, to help you narrow your options, we compiled, tested, compared, and ranked eight exceptional anti-snoring devices. If you would like in-depth explanations about the features and advantages of each device, please refer to the product reviews on our site. 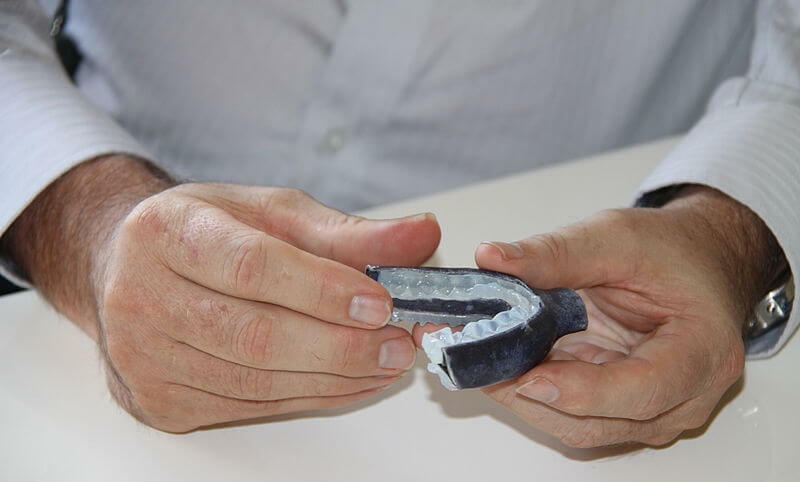 To limit the number of prospective products, we only considered Mandibular Advancement Devices (MADs) or intraoral inserts used to treat sleep-related breathing problems. One of the MADs has a built-in tongue restraining device (TRD), but we did not test any standalone TRD products. There are three significant factors to consider before buying an anti-snoring device: technical features, value, and comfort. The best device should maximize its value and user’s comfort without reducing the effectiveness of its technical elements. The most important characteristics to look for in an anti-snoring device are the features that help it eliminate snoring. In this guide, we examine jaw alignment, custom impressions, fixed positioning, and tongue restraint capabilities. A device’s value encompasses more than just its price. When we mention value, we’re referring to the initial cost of the item, the ease of the ordering process, shipping options and rates, the quality of customer service, and lastly, the device’s return policy. Each component affects how valuable the device would be to a potential customer. Quality customer care is essential. A device isn’t worth buying if the overall ordering process and client services are poor. Even if you find a product that fits your needs, it may not be the perfect match for you. Clear and lenient return policies are necessary so you can try various products without worrying when something goes wrong or if you need to return your device. Studies regarding sleep and sleep-related health issues show that anti-snoring devices are 93% effective in reducing snoring. Since manufacturers construct Mandibular Advancement Devices according to similar concepts of functionality, most will reduce your snoring to some extent. Results will vary by each user’s individual receptiveness to the products, so we didn’t use a recording device in our lab tests. Instead, we’ll show you which devices have the highest chances of eliminating your problem based on their technical attributes. The following chart ranks Mandibular Advancement Devices by features. Tray calibration allows you to adjust your lower jaw forward or backward to maximize anti-snoring success. Tongue restraining devices hold your tongue in place while you sleep, reducing the risk of blockages to your airways. 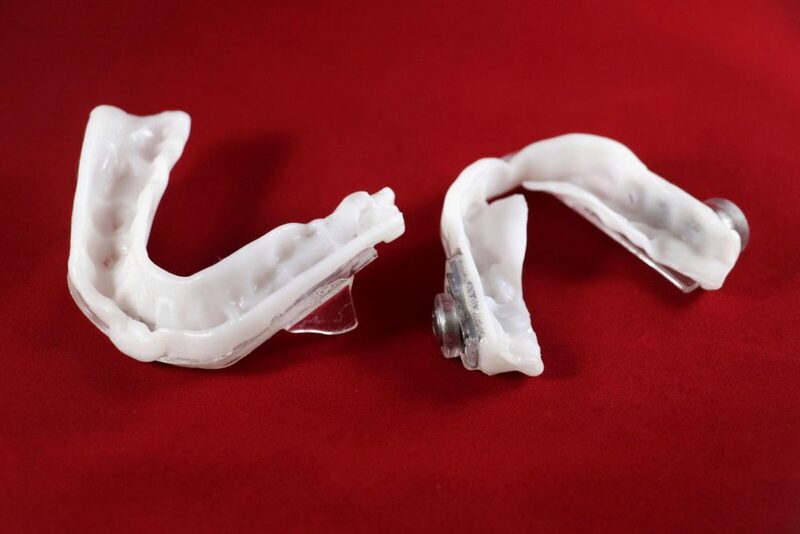 Custom impressions are vital to the success of an anti-snoring product because they keep your jaw from collapsing backward during sleep. For comfort, being able to open and close your mouth is a better feature. However, we rated fixed position as a positive characteristic because it’s more effective in eliminating snoring. For assessments about the comfort of these devices please read the product reviews on our site. For safety, and patriotic, reasons, it’s better if the device is made in the United States. This rating notes whether a device has any materials, screws, or adjustments that hinder the placement of the device in the mouth, or could cause gum soreness. MADs with multiple sizes give users the option to choose a small or large device based on their gum line and jaw size. For this category, we consider the quality of customer service, refund, and return policy availability, shipping cost and delivery times, and the product’s price. SnoreRx placed highest on our comparison chart with 13 points. This device comes from a company with a history of designing exceptional sleep-related products. Although SnoreRx is pricier than most on the list, its unique features and expert construction make it a worthwhile purchase. What sets this device apart from its peers is the level of customization it offers. SnoreRx has a calibrator on its side that allows users to adjust the position of their lower jaw. The calibrator has ten settings and a reset mechanism so you can maximize your comfort. This device doesn’t contain allergy-inducing irritants such as latex, acrylics, and alloys and is BPA-free. SnoreRx’s manufacturers construct it from medical-grade materials, making it a fantastic choice for individuals with allergies or sensitivities. SnoreRx has an average lifespan of 12 to 15 months, which is significantly longer than most Mandibular Advancement Devices. Second place is a three-way tie between Zyppah, Therasnore, and VitalSleep at 11 points. While not as extensive as SnoreRx, these devices offer multiple features that combine to reduce snoring symptoms. Zyppah is a favorite MAD that sets the lower jaw in a forward position to decrease the occurrence of partial airway obstructions. Zyppah combines the basic functionality of MADs and tongue restraining devices (TRD), keeping both your tongue and jaw stationary while you sleep. Zyppah is comfortable to wear and made from BPA-free materials. Unfortunately, the product may cause jaw soreness as you adjust to wearing it. Zyppah’s largest con is their poorly rated customer service. Most users who try the product claim to have poor experiences dealing with the customer service representatives. Therasnore is a UK company, so the return costs are higher than that of the US-made products. However, it’s mid-range pricing and effective features are a good trade-off. Like other MADs, this anti-snoring device positions the jaw forward to reduce the risk of airway obstacles. Therasnore lives up to its international acclaim. It is extremely comfortable to wear and its custom-fit properties are easier to maneuver than those of devices like Zyppah. VitalSleep offers many features other MADs have such as custom impressions and tray calibration. VitalSleep is also the only multi-size device on our product list. This MAD comes in two sizes: regular and small, which the company recommends for men and women respectively. VitalSleep offers decent functionality and comfort, making it an all-around suitable product. AirSnore and SnoreMedic are the most affordable of the MADs listed, rank in third place for acceptable features, reasonable pricing, and excellent customer service. AirSnore, with its standard design, doesn’t have unique functions like other MADs, and the UK-based product can take weeks to reach the United States. However, if the price is attractive to you, it may be worth trying. AirSnore has a 60-day return policy, so you can take your time before deciding whether to send it back. SnoreMedic is a new company, and while their anti-snoring devices have fewer features, they are very affordable (we gave it value 3 points for its low price). Both appliances include custom impression molds but don’t have TRDs. Customers who have purchased these devices speak highly of their client care services. Sleep Tight is the lowest ranking devices on our comparison chart at 6 points respectively. Despite missing many key features like custom impressions, Sleep Tight is a commendable anti-snoring device that was designed by a dentist and ships from the UK. Sleep Tight has a plain design, but it makes up for it with longevity and custom fitting. You can refit this device up to five times, and it has an average lifespan of six months to two years. 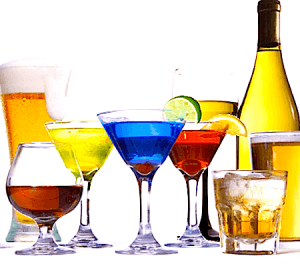 Regardless of how we rank them, you may have vastly different experiences with the product you choose. Our personal favorite is SnoreRx. We suggest using SnoreLab or SnoreReport apps on your mobile phone to test the effectiveness of your device. Try multiple products and return them if they don’t work for you. Remember to be patient, try each device for several weeks, and don’t give up if you don’t find your perfect product right away.